Not to be confused with Welsh musician John Cale. 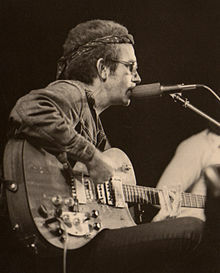 John Weldon Cale (December 5, 1938 – July 26, 2013), commonly known as JJ Cale, was American singer and songwriter. He was one of the people who started the Tulsa Sound. In 2008, he won a Grammy Award. ↑ "Bio". JJ Cale official website. Retrieved 17 January 2014. This page was last changed on 28 May 2015, at 00:39.